The Cuban "WASP" spies arrested in 1998 used coded material on computer disks to communicate with other members of the spy network. 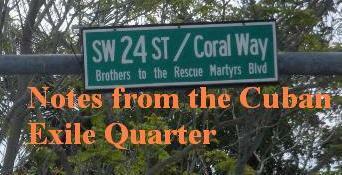 Below are two excerpts from the 1,300 pages taken from those diskettes translated and used during the spy trial that demonstrate the criminal nature of the Cuban regime's operation in South Florida. In the first excerpt it declares that their primary objective was "penetrating and obtaining information on the naval station located in that city." In the next excerpt intelligence operatives communicated about "burning down the warehouse" and sabotaging Brothers to the Rescue equipment. Also requested that they attempt to identify who would be flying at certain times. International organizations recognized that Armando Alejandre, Carlos Costa, Mario de la Peña and Pablo Morales were murdered by agents of the Cuban government on February 24, 1996. The first of the participants in the conspiracy to be held accountable for his actions was Gerardo Hernandez who was sentenced to life in prison for conspiracy to commit murder. SINCE THE VERY BEGINNING THE ESSENTIAL IDEA OF THE OPERATION WAS FOR A-32 TO JOIN WITH THE ILLEGAL CENTER THAT WAS BEING DIRECTED BY A-4 AND WAS FUNCTIONING IN THE STATE OF FLORIDA. THE FUNDAMENTAL OBJECTIVE OF THE OPERATION IS TO ESTABLISH S/A A-32 IN KEY WEST FOR THE PURPOSE OF PENETRATING AND OBTAINING INFORMATION ON THE NAVAL AIR STATION LOCATED IN THAT CITY. ALSO, TO MAKE CONTACTS WHICH CAN PROVIDE US WITH MILITARY, POLITICAL , BIOGRAPHICAL AND OPERATIONAL INFORMATION AS AS TO STUDY COUNTERREVOLUTIONARY ORGANIZATIONS EXISTING IN THE AREA AND CARRY OUT STUDIES ON THE OPERATIONAL SITUATION OF ROADS, MAINLY IN KEY WEST. A-32 WILL BE THE MAIN PARTICIPANT AND HE WILL BE DIRECTLY UNDER I.O. A-4. 1.-) TRY TO IMPEDE THE CONSUMPTION OF INTENTIONS OF THE OPERATION P.A.L. (PAN, AMOR Y LIBERTAD) OF THE COUNTERREVOLUTIONARY ORGANIZATION BROTHER’S TO THE RESCUE. 2.-) AFFECT AND DISCREDIT THE IMAGE OF SAID ORGANIZATION. 1.-) PERFORM THE OPERATIONAL SITUATION STUDY OF THE HANGAR AT THE OPA LOCKA BASE WHERE THE ORGANIZATION KEEPS AND OPERATES THEIR PLANES. 2.-) THE POSSIBILITY OF BURNING DOWN THE WAREHOUSE OF THE COUNTERREVOLUTIONARY ORGANIZATION, AND AFFECT THEIR PLANES, MAKING IT SEEM LIKE AN ACCIDENT, NEGLIGENCE OR SELF DAMAGE. KEEPING IN MIND THAT THIS PLACE MAY BE SECURED AND THAT IN CASES LIKE THESE, INVESTIGATIONS ARE PERFORMED, RUMORS WILL LEAK THAT BASULTO AND HIS PEOPLE CAUSED THE DAMAGE THEMSELVES TO COLLECT THE INSURANCE AND GET MORE MONEY FROM THEIR CONTRIBUTORS. 3.-) ATTEMPT TO DISABLE THEIR EQUIPMENT AND TRANSMISSION ANTENNAE ON LAND, THE ONES THEY USE TO COMMUNICATE WITH DURING THEIR MISSIONS, MAKING IT SEEM LIKE NEGLIGENCE. NOTE: THESE THREE POINTS WERE REQUESTED OF CASTOR VIA RADIO MESSAGE. IT HAS TO BE DETERMINED WHAT HE HAS BEEN ABLE TO OBTAIN. 4.-) ANALYZE WITH CASTOR IF HE COULD INFORM US AHEAD OF TIME (DETERMINE PRECISE TIME) WHEN THE BROTHER’S TO THE RESCUE PLANES WILL BE TAKING OFF, WHO IS IN THEM AND IF THEY ARE GOING TO LAND AT A SPECIFIC PLACE. WHAT PERSONNEL KNOWS THIS INFORMATION BEFOREHAND. AT SOME POINT, CAN IT BE DETERMINED WHO PROVIDED THIS INFORMATION. THE OBJECTIVE OF THIS OPERATION IS TO DEVELOP A SERIES OF ACTIONS AGAINST CIA AGENT JESUS CRUZA FLOR. 2.-) ONCE THE HOUSE IS PHOTOGRAPHED, MAKE VARIOUS THREATENING TELEPHONE CALLS (TWO OR THREE) CONCERNING HIS NEARING EXECUTION. THESE CALLS WOULD BE AT DIFFERENT HOURS AND DIFFERENT DAYS. TRY TO USE THE EQUIPMENT (CALLED SCRAMBLER OR SOMETHING SIMILAR) TO CHANGE THE VOICE. PHONE BOOTHS SHOULD BE SELECTED THAT ALLOW A QUICK EXIT OUT OF THE AREA. KEEP IN MIND THAT THE MEASURES IS AGAINST A CIA AGENT AND HE COULD HAVE CALLER ID TO FIND OUT THE TELEPHONE NUMBER THAT IS CALLING AND THE ADDRESS WHERE IT IS LOCATED. ON THE OTHER HAND, KEEP IN MIND THE REST OF THE SECURITY MEASURES THAT SHOULD BE TAKEN IN THE BOOTH, SUCH AS FINGERPRINTS, HAIR, ODORS, SALIVA, DRESS, THAT THERE BE NO PERMANENT PERSONNEL IN THE AREA TO RECOGNIZE THE CALLER. DO NOT LEAVE THE CAR WHERE IT CAN BE OBSERVED, THE DURATION OF THE CALL. DO NOT RESPOND TO ANY QUESTIONS ASKED. 3.-) PREPARE AN ALLEGED BOOK-BOMB (BOOK, CABLE, BATTERIES, PLASTIQUE, ETC., AND SEND IT VIA EXPRESS MAIL. KEEP IN MIND TO WRAP THE BOOK IN A PROTECTIVE PAPER, WHICH IF THE ENVELOPE IS PASSED THROUGH THE X-RAY MACHINES, IMPEDES THE DETECTION OF WHAT IS INSIDE, AND THEREFORE IT WILL NOT BE ROUTED THROUGH THE MAIL. KEEP IN MIND TO OBTAIN THE ENVELOPE, AS WELL AS THE POSTAGE, MANY DAYS IN ADVANCE AND SELECT A BUSY PLACE. USE A SPECIFIC CAMOUFLAGE. STUDY THE MAILBOX WHERE THE PACKAGE WILL BE DEPOSITED, AS WELL AS THE TIME IT WILL BE DEPOSITED. ANALYZE HOW YOU WILL GET OUT OF THE AREA. DURING THE ENTIRE PROCESS KEEP THE SECURITY MEASURES IN MIND, SUCH AS THE ONES MENTIONED BEFORE, GIVING SPECIAL ATTENTION TO FINGER PRINTS DURING THE ENTIRE PROCESS. EVALUATE THE POSSIBILITY OF USING MANOLO TO MAKE THE CALL, THE TOPOS TO DEPOSIT THE ENVELOPE AND A-4 TO PREPARE THE BOOK-BOMB.